This truly impressive detached family home is set in a picturesque rural setting within beautifully tended, mature gardens extending to approx. 1 acres. The location provides ease of access to the A1 dual carriageway, and is only a short commute to the Hillborough and both Lisburn and Belfast. Conveniently located within a few miles to Dromore Village with a range of local amenities, shops bars and restaurants. This beautiful detached family home has been finished to a most exacting standard with an impeccable attention to detail. The Accommodation is both bright and versatile to suit the needs of a range of purchasers. The accommodation comprises, four A large Sun Room with views over the gardens, a bespoke fully fitted kitchen with excellent range of integrated appliances and feature island unit. There are three well-proportioned bedrooms to the ground floor, with bedroom one benefiting from an en-suite shower room and an attractive white suite four-piece bathroom. To the first floor there are three further bedrooms and a large games room or an additional bedroom whichever the new purchaser requires with bedroom six benefitting from an en-suite shower room. Further attributes include a separate utility room, ample storage facilities, oil fired central heating and double glazing throughout. 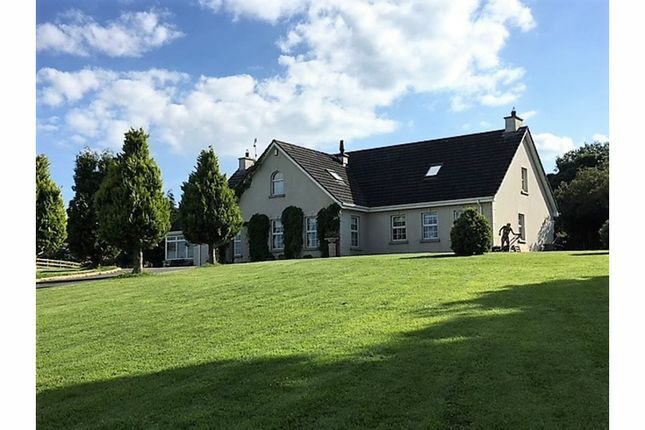 The property is situated on a delightful site extending to circa 1 acres with beautifully tended gardens laid in lawns with an array of mature planting. The rear gardens are fully enclosed offering an excellent degree of privacy for entertaining. Additionally, the sweeping driveway provides ample car parking for numerous vehicles and leads to a detached double garage with electronic roller shutter door. With so many great attributes this property is ideal for those seeking modern living in a relaxed picturesque setting with the convenience of road networks close by for commuting. A fully tiled and spacious reception hall, telephone point, under stairs storage and a large hot-press. An attractive open feature sandstone fireplace with granite hearth. TV point, feature backlit glazed display shelving. 2 double radiators. Feature cast iron fireplace with a polished granite hearth, tiled floor, double radiator and a glazed oak door leading to a large Sun Room. A bright and spacious sun room which Features a timber ceiling, tiled floor, TV point, French doors leading to the rear and two double radiators. A beautiful bespoke fully fitted kitchen boasting a wide range of solid wood high and low level units. A granite work surface incorporating a twin bowl ceramic sink unit with mixer taps, window pelmet with low voltage recessed spot lighting, display shelving with plate rack, backlit and glazed display cabinet. The large kitchen also benefits from a large island with a solid wood top which incorporates a wine rack, drawers and cupboards and a built in dish washer. There is also a space for a range style cooker, an over sized extractor canopy, built in fridge freezer, tiled floor, TV point, recessed spot lights and two double radiators. An excellent range of matching solid wood high and low level units, ceramic Belfast sink with mixer tap, wine rack, space for an under counter fridge, plumbed for washing machine, tiled floor and a double radiator. TV point and a double radiator. A contemporary white suite comprising, low flush W.C., pedestal wash hand basin with mixer tap, fully tiled corner shower with Mira thermostatic mixer valve, tiled floor and a double radiator. A luxury white suite comprising, low flush W.C., pedestal wash hand basin, a feature centre Jacuzzi bath with mixer tap and telephone hand shower. A fully tiled corner shower cubicle with Mira thermostatic shower, 1/2 timber panelled walls, tiled floor and a double radiator. A spacious landing, panelled radiator. TV point and a double panel radiator. Walk in wardrobe, access to under eaves storage, double glazed Velux window and a double radiator. Walk in wardrobe, access to storage in eaves, double glazed Velux window and a panel radiator. A modern white suite comprising, low flush W.C., pedestal wash hand basin, fully tiled double shower with Mira thermostatic shower, tiled floor and a double radiator. A modern white suite comprising, low flush W.C., pedestal wash hand basin, a fully tiled double shower with a Mira thermostatic shower, tiled floor, shaver socket, double glazed Velux window and a double radiator. A large games room which currently occupies a full sized snooker table as well as various other equipment making this an ideal room with many different uses. Access to under eaves storage, two double glazed Velux windows and a double radiator. Pillared entrance with remote electric gates, a sweeping tarmac driveway leads to pebble parking area to the front and side of the property. The private site benefits from stunning panoramic views over the surrounding countryside, an enclosed mature lawn to the front with mature trees and shrubs. To the rear there is also an enclosed garden in lawn with mature trees and shrubs and a paved patio area. Twin up and over remote control electric doors, oil fired central heating boiler, W.C., light and electricity.